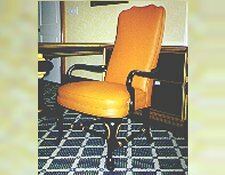 Norine Decorators - Samples of fine furniture and upholstery by the designers. Here are just a few samples of the high quality work we do. We, of course, can not show the thousands of furniture, wall, and window treatments we have done, but you can get an idea of the professional craftsmanship. Let us Help You Make Your Decorating Dream A Reality! is then covered in muslin, and finished off with cotton batting and then the high quality finishing fabric of your choice! Please CONTACT US For Additional Information Or Any Questions. Photo's are representative styles that can be finished in any fabric. Photo's provided as a courtesy from Frank Chervan Frame Co.